Today members of ECD Design Team are doing another focus day and today it is for Susan’s Garden’s new release which consists of 8 dies. You are going to love them! For my card today I have chosen to use 3 of the new release Galvanized Bucket, Forsythia and Frosty Fern. Sentiment is from Joset’s Words 1 – Celebration set. Be sure to visit Elizabeth Craft Designs Blog to see what other team members have created with this new release for Susan’s Garden. Here is how I created my card. Step 1 Using 3 Distress Oxide Reinkers (Peeled Paint, Fossilized Amber and Worn Lipstick used here) put 3 drops of of peeled paint, 3 drops of fossilized amber and 1 drop of worn lipstick onto non stick craft mat spritz with water take 5″ X 8-1/4″ white Soft Finish Cardstock spritz with water then tap into ink lift and tap again drying in between continue until piece is covered and to your liking. Cut to 5″ X 7″ taking remaining piece add Clear Double Sided Adhesive to back die cut “happy birthday” then cut again from black cardstock with Clear Double Sided Adhesive on back place colored piece on top of black. Step 2 Cut 5-6 pieces of Garden Notes – Frosty Fern from green cardstock. Using white Nuvo Drops add a little to each tip of fern Do Not do berries you want the white flat. Set aside to dry. Pinch up on fronds to give dimension. Step 3 Using Garden Notes Forsythia die cut flowers from yellow cardstock, stems from brown and leaves from green. I cut 2 plates of flowers for each stem I cut 4 sets of stems (2 stems per set) Using green Copic marker add dot to center of each flower lay right side down on molding mat use small loop tool from Susan’s Garden 4 pc. All Metal Tool Kit shape each petal by pulling tool from tip to center of each petal. Turn over use medium ball tool from tool kit push into center to cup. Using Kids Choice Glue add flowers to stems. Shape and shade leaves add to stems. 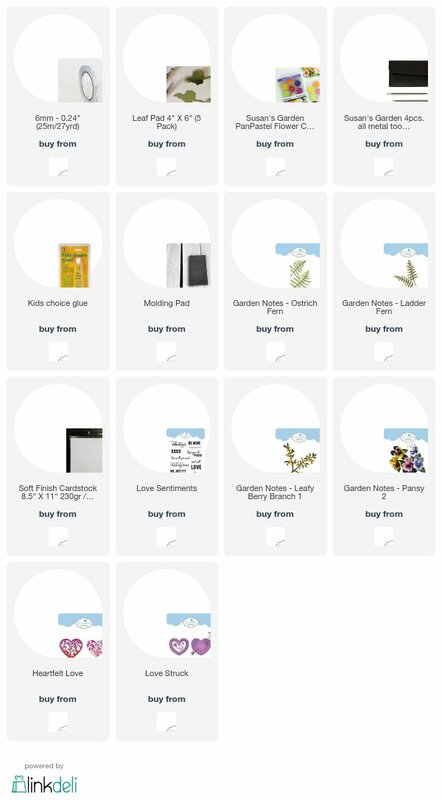 Step 4 Using Garden Notes – Galvanized Bucket die set cut 2 buckets and handles from gray cardstock 1 with Clear Double Sided Adhesive on back adhere 1 to other same with handle. Cut 2 of wooden grip from light brown cardstock. To do galvanizing see Susan’s video on her Facebook page Susan’s Garden Club found here. I got a little heavy with black marker so it looks more cast iron then it does galvanized. Step 5 Form 5″ X 7″ card base from white Soft Finish Cardstock. Step 6 Cut white Soft Finish Cardstock 5″ X 7″ using largest Fitted Rectangle die set cut opening placing die approximately 1″ from bottom. Step 7 Build your card. Adhere background piece to card front using Clear Double Sided Adhesive. Adhere piece with opening to front of card. Take bucket pinch sides with fingers to give a little curve add a couple pieces of dimensional tape in center add Kids Choice Glue around outer edge of bucket making sure not to glue top opening of bucket as you will want to put your stems down through that opening. Add handle using Kids Choice Glue to adhere. Arrange stems and ferns adhering with Kids Choice Glue. Finally add happy birthday to bottom of card using Kids Choice Glue. Hope that you have enjoyed this tutorial today and be sure to visit Elizabeth Craft Designs Blog. 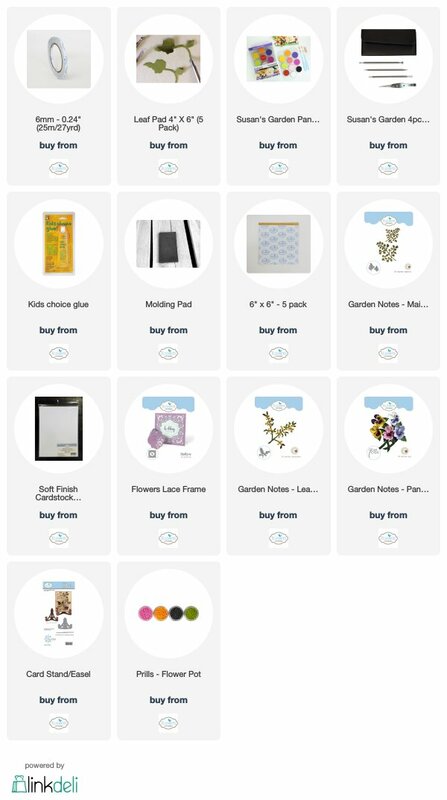 You can purchase supplies by clicking on any of the supply pictures below it will take you to Elizabeth Craft Designs. Until next time – Happy Crafting! Hello my crafty friends. I don’t know about you but I am so wanting spring to come but I know here in Maine we have a while to go so I am creating my own spring by making Susan Tierney-Cockburn’s paper flowers. My post today uses her new release Garden Notes Lilac 2 along with and her Garden Notes Ladder Fern from previous release. I have also used ModaScrap’s new release Romantic Bouquet.The “happy birthday” is from an older release of A Way With Words by Suzanne Cannon and all can be purchased from Elizabeth Craft Designs. Here is how the card was created. Step 1 Make card base by cutting white cardstock 6″ X 12″ score at 6″ fold on score line. Step 2 Emboss card front using a large embossing folder. Step 3 Using white Soft Finish Cardstock with Clear Double Sided Adhesive on top die cut ModaScrap – Romantic Bouquet and A Way With Words happy birthday. Also cut happy birthday from black cardstock with Clear Double Sided Adhesive on the back. Step 4 using Silk Microfine Glitter – (Sea Glass used here) coat the Romantic Bouquet and the white happy birthday and burnish in. Attach the Romantic Bouquet to bottom of card front using Kids Choice Glue. Attach the happy birthday to the black happy birthday offsetting just a bit to give appearance of a shadow using Kids Choice Glue. Step 5 Cut 1 set of Garden Notes Ladder Fern from green cardstock shade with Distress Inks and shape by laying fern on Leaf Pad. Take leaf tool from Susan’s Garden 4 pc. all metal tool kit pull tool down center stem and each frond. Using tweezers from tool kit hold center stem in tweezers and pinch up on fronds. Step 6 Make 3 flowers and several leaves using Susan’s new Garden Notes Lilac 2 die set using White Soft Finish Cardstock green cardstock for leaves and brown for the stem. For the purple lilac a couple shades of purple Distress Ink was used on white Soft Finish Cardstock then die cut. Susan has a video on her Facebook page Susan’s Garden Club which you can see here. Step 7 Arrange on card front using Kids Choice Glue to attach. Hope you have enjoyed my post today and that it has inspired you to create your own. For any of the Elizabeth Craft Designs products just click on the picture and it will take you right there. Today’s post is a card I created for Elizabeth Craft Designs Blog for complete tutorial be sure to visit their blog found here. Welcome all my crafty friends! Valentine’s Day is quickly approaching and today I am posting a couple that I have created. They are same card but I changed out the color of pansies a bit and used ferns. These cards were created using Susan’s new releases Garden Notes Pansy 2 and Leafy Berry Branch 1 along with a couple of her ferns from last release. The hearts are from Becky Seddon’s new releases Heartfelt Love and Love Struck. Step 1 Cut 1 Garden Notes Berry Branch 1 from green cardstock. Using Nuvo Crystal Drops add berries let dry. Repeat on back side and let dry. Step 2 Cut white cardstock 6″ X 12″ score at 6″ fold on score line – 6″ X 6″ card base formed. Dry emboss front of card. Step 3 Cut large solid heart from red cardstock using Becky Seddon’s Heartfelt Love die set. Attach to card front using Clear Double Sided Adhesive. Step 5 From gold cardstock cut the 2 piece arrow from Love Struck die set attach using Kids Choice Glue. Step 6 Cut 1 set of ferns from green cardstock using fern die set of choice. Shade a little with Distress Ink and bend up fronds to give dimension. Attach to card front with Kids Choice Glue added to just stem area. Add Leafy Berry Branch in same manner arranging over ferns. Step 7 Cut, color and shape 3 Garden Notes Pansy 2 and several leaves using white Soft Finish Cardstock. Susan has a video on her Facebook page showing how to do pansies you can find it here which is dated January 27th. Attach to card front using Kids Choice Glue. Step 8 Cut red cardstock 2-3/4″ X 1-1/4″ . Cut white Soft Finish Cardstock 2-1/2″ X 1″ attach to red cardstock. Using black ink stamp Happy Valentine’s Day from Joset’s Love Sentiments onto white cardstock. Attach to lower right corner of card front using dimensional tape. I do hope you have enjoyed my tutorial today and will create some of your own valentines. 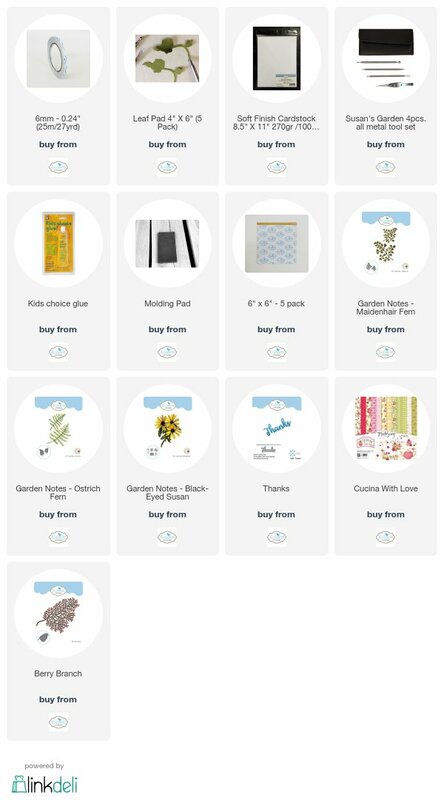 For any of the Elizabeth Craft Designs supplies you can click on any of the pictures below and it will take you directly to their site. Hello Everyone thank you for stopping by my blog today. My post today is a new challenge for Susan’s Garden Design Team. This Month we have been challenged to use 2-3 of Susan’s new releases – I have chosen 3 the Black-Eyed Susan and 2 of the new ferns Maiden Hair and Ostrich. Be sure to go to Elizabeth Craft Designs to see more of Susan’s new releases and enter the challenge drawing for a chance to win a prize. For today’s challenge Elizabeth Craft Designs are giving away a $20 Gift Card to use on the Elizabeth Craft Designs website to 3 winners. The winners will be announced on Friday, November 17th, on the Elizabeth Craft Designs blog. Here is how it was done. Using Els van de Burgt Studio Berry Branches cut 4 branches from brown cardstock. Double branches using kids choice glue for added thickness. Add berries using either Nuvo Crystal Drops or Red Pearl Pen (which was used here). Set aside to dry. Form 6′ X 6″ card base from white Soft Finish Cardstock. Cut patterned paper 5-3/4″ X 5-3/4″ (ModaScrap “Cucina With Love Collection” used here). Attach to card front using Clear Double Sided Adhesive. Cut burlap paper 5-1/4″ X 5-1/4″ fray edges on all 4 sides. Attach to card front using Clear Double Sided Adhesive. Using Susan’s Garden Black-Eyed Susan Die Set and white Soft Finish Cardstock cut 5 sets flower petals, black cardstock cut plate of seeds for 5 flowers and from green cardstock cut leaves. Color, shade, shape and assemble. Watch Susan’s video for guidance which can be found here. Using Susan’s new Maiden Hair and Ostrich Fern Dies cut 2 each from green cardstock (I used 2 different shades of green). Using Distress Ink shade ferns. Lay right side down on molding mat using medium ball tool from Susan’s Tool Kit rub back of Maiden Hair Fern fronds turn over run tool down stem for the Ostrich Fern use tweezers from tool kit to pinch up each frond then run medium ball down stem giving ferns some dimension. Arrange ferns, flowers and berry branches on front of card when they are where you want them attach using Kids Choice Glue. You may not use all the ferns or you may cut some apart whatever appeals to you. Berry branches I did cut apart and tucked in where I wanted. Using Els van de Burgt Studio Thanks die cut 3 from black cardstock with Clear Double Sided Adhesive on the back. Stack together ( gives nice dimension) attach to upper right of card front. Elizabeth Craft Designs Blog to enter for a chance to win in a prize. 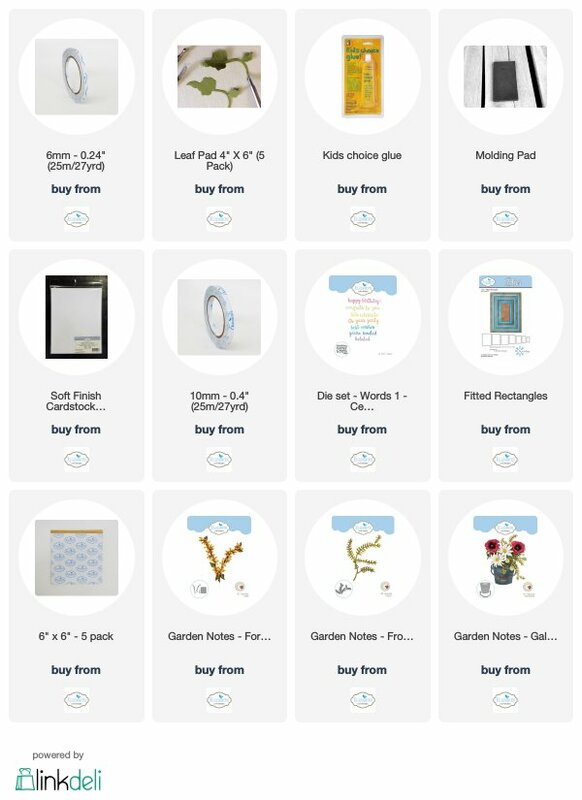 If you are interested in any of the products used today you can click on any of the pictures and they will take you to Elizabeth Craft Designs.